My kids love reading eBooks on the computer. We have download a bunch of traditional stories for them but they also love “new” stories. So this past week I download the Little Acorns ebook from the Twinkl Resources website. It is a very sweet story about a little acorn who falls off his tree and gets buried in the ground and then starts to grow (includes the full life cycle of an oak tree). We actually used it as reading practice for my youngest and it was perfect for him. While we were reading the story both kids commented on how some of the words were written in unusual fonts and sometimes as pictures. I never knew this but these words are called Calligrams (words or phrases where the design and layout of the word creates a visual image which relates to the words meaning). So we thought it would be fun to try to create some of our own. Both kids loved the activity and sat happily for ages writing and rewriting words trying out different fonts and ways to decorate the different words. It ended up being a great spelling activity for the kids. And my youngest really impressed me with how much he wrote and how he kept trying to find ways to express the words. I just love his idea of tall inside a giraffe. And we even had a go at making some more crafty calligrams. The words can be as simple or as complex as you want. I like the fact that there is no right answer to this. So everyone who tries can come up with their own idea. Please note – The Twinkl packages I mention in my posts are the valid packages at the time of me writing the post. Any changes that may occur with the packages are at the discretion of Twinkl. 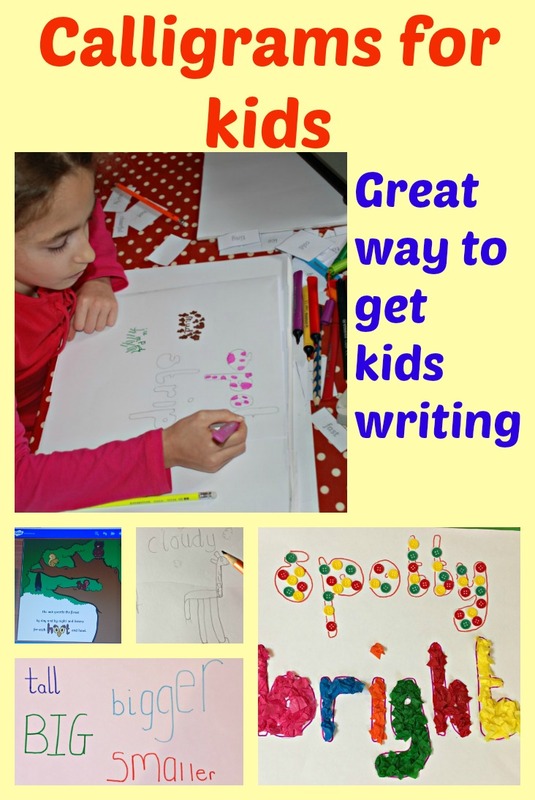 This entry was posted in English Ideas and tagged Calligrams, creative kids, eBooks, English Ideas, home education, homeschooling, sight words, Twinkl. Bookmark the permalink.